This cross-border route follows the river Dee along both sides of its estuary, through the historic city of Chester, the borderlands, the stunning Dee valley, past Llyn Tegid to its source high on Dduallt above Llyn Tegid in Snowdonia National Park. It passes the historic Roman city of Chester and through a succession of attractive towns and villages: Aldford; border communities of Farndon; Bangor-on-Dee, Overton and Chirk, then Llangollen, Carrog, Corwen, Llandrillo, Y Bala and Llanuwchllyn. Borderland flood plains lead from the tidal limit at Chester weir. There are broad wooded valleys, and steep-sided valleys between Llantysilio Mountain and Moel Ferna (Berwyns). En route are castles, old churches, ancient bridges, and canal and railway engineering. The long tidal estuary, with its mudflats, saltmarshes, sand dunes and low cliffs, is renowned for its birdlife. In addition to the continuous long-distance walk, the guidebook includes a 57½-mile estuary walk between Hoylake and Prestatyn and a 14-mile upland circuit of Llyn Tegid, Wales' largest natural lake, plus 23 linear day walks linked to public transport. The route incorporates the waymarked Dee Valley Way, which runs for 15 miles between Llangollen and Corwen. The walk elevation profile below shows the 142 mile route between Prestatyn through Chester and Llangollen to the source of the Dee. 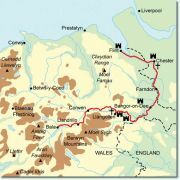 Map by permission of 'Contours Walking Holidays' and image of Carrog on book page by David Berry.